Sojourn – Let's Read TSR! It’s been four trilogy-ending books in a row — that’s a lot of conclusions! 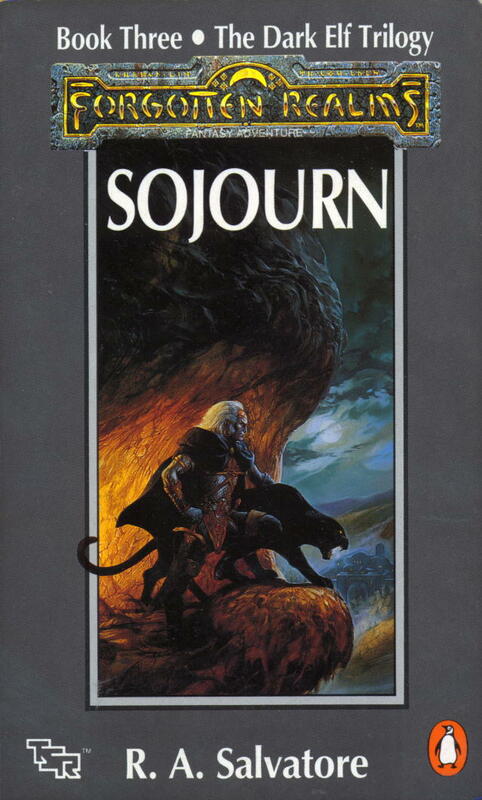 This last one is the final book of the Dark Elf trilogy, which means we’re in for more confused morals about racism courtesy of Drizzt Do’Urden. This time around, Drizzt leaves the Underdark and tries to adapt to the surface world. He experiences winter for the first time, learns about the natural world, gets chased over half of northern Faerûn by some rangers, tries and fails to find acceptance in human society, and finally ends up settling in Icewind Dale to set up the events of the first trilogy. There’s a lot of promise in this “fish out of water” premise, but does Sojourn do a good job of delivering on it to cap off this prequel trilogy? Hah… no. It definitely deserved better than this. Unfortunately, it’s a hot mess when held up against the comparatively well-crafted plots of the previous two books. This book’s central problem is that it feels like a series of disconnected episodes rather than a coherent story. There are very distinct sections — the village of Maldobar, Dove’s pursuit, living with Montolio, road trip, and finally Icewind Dale — which share practically no characters between them, happen in different places, and don’t really interact with each other except inasmuch as each episode has to set up the events of the next. They don’t even feel like pieces of the same book; Salvatore could have made this a collection of short stories rather than a novel and it wouldn’t have changed much. 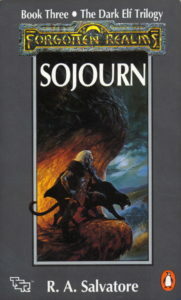 And save for Drizzt himself they don’t share any plot, characters, or setting with either Homeland or Exile, so Sojourn doesn’t really feel like part of the same trilogy. As a result, the pacing is all over the place. Each section has its own little introduction, rising tension, and then climax, so you never feel like the story is building up to something good. It culminates (if that word applies here) in a big battle against orcs in Mooshie’s Grove at around the 70% mark of the book, and everything after that point feels like an extended and somewhat pointless denouement. Now that I think about it, this book really would have worked better as a collection of short stories; at least then I wouldn’t have had these unfulfilled novel-based expectations about plot and pacing. Drizzt is less insufferable here than he’s been in the past. He’s in a completely new place which he’s trying to learn the rules of, so he’s less self-confident here than in his previous appearances. He’s occasionally outmatched by his opponents — in particular, Dove’s rangers posed a serious challenge and probably could have successfully hunted down and killed our protagonist if they hadn’t changed their minds about him. And the social problem of finding a place where he’ll be accepted isn’t something he can solve by stabbing things. Best of all, this book avoids the usual Drizzt cliché of “all good people instinctively like him and all bad people act racist to him.” There are a number of decent people who initially assume that he’s evil, then gradually warm up to him as a result of his actions. The end result is that acceptance doesn’t feel like a cheap and easily-won victory here, as it has been in every previous Drizzt book. The weakest part of this book by far, unfortunately, is the villains. There’s a rotating stable of bad guys who hang around for part of the book, then get offed — the narrative equivalent of wandering monsters. It starts with the barghests, a couple of irredeemably evil and murderous fiends who coincidentally happen to be hanging around the spot where Drizzt emerges. Since they’re from another plane, they have no ties to the setting or to the other characters in it, and their brand of evil is too cartoonish and over the top to take seriously. Drizzt kills them off about a quarter of the way through the book and they vanish from the plot. Later, an orc warlord and his winter wolf ally show up for another quarter-book or so, receive even less characterization than the barghests did, then get their asses decisively kicked and are never mentioned again. And then there’s an extended bit with a dragon which was just goofy as hell and felt like unnecessary padding for the weak plot structure. The only constant villain throughout the entire book is Roddy McGristle, a murderous hillbilly bounty hunter who comes into conflict with Drizzt early on. It’s a well-established truism in fiction that a good way to generate interesting conflict is to make your villains the dark mirror of your heroes, the opposite of who they are and what they stand for. So from that point of view, a closed-minded, vengeful, unprincipled dickhead makes a kind of sense as an antithesis to Drizzt. But something about him just doesn’t work for me. We don’t get a lot of detail about him, character-wise, except that he’s greedy and vengeful. He’s got no backstory and not much characterization that doesn’t relate to hunting Drizzt. His determination to kill Drizzt — a project which spans about seven hundred miles and several years of his life — seems all out of proportion to the injury which began their feud. And after all that, Bruenor disposes of him effortlessly in an anticlimactic fashion at the end, long after he’s started to feel like a vestigial appendage to an already overlong plot. Montolio, Drizzt’s ranger mentor who teaches him about the surface world, feels particularly weird to me. On the surface, he seems like a very positive character: sensitive, empathetic, moral, and a big fan of killing bad things to make the world safe for nature and good people. But there are a number of things about him that just don’t work. I’ll go into more detail about some of that later, but one big problem with him character-wise is the whole faux-blindness angle. Several years ago he went completely blind, yet he still lives alone in the wilderness and can get around, shoot arrows, fight with swords, and even bungee-jump (seriously!) just as well or better than a sighted person. At no point in the book is he ever hindered by being blind. There’s no supernatural explanation offered for this; he doesn’t have Daredevil-style super senses or some sort of empathic connection to his environment. (He can have conversations with animals, which helps a bit but doesn’t fully explain things.) It’s just sort of handwaved as “he’s just that good.” This book wouldn’t be different in plot or tone if he were normally sighted, and it would make his character a bit less hilariously unbelievable. There’s one particularly interesting character here whom I just have to call out: Fret, the camp gay dwarf who accompanies the rangers on Drizzt’s trail. He’s fastidious, fashion-minded, fussy, and fabulous — but all in a manner that’s just understated enough to not trigger the censors at TSR. I think it’s the first hint of the concept of alternative sexuality in the Realms novels, even though it’s encoded in a way that kids and teenagers probably wouldn’t understand. And it’s good to see that, despite his fussiness and constant complaining, he’s still a brave and unambiguously heroic character. It further’s the book’s theme of exceptions to racial stereotypes, since he’s about as un-butch a dwarf as you can get. Once again, the theme is racism. Drizzt’s search for acceptance is frequently foiled by people making assumptions about him based solely on his race, which, as I’ve discussed in an earlier review, is actually not a great metaphor for real-world racism. The same objections I had there apply here: when you’re the lone good member of a race of deceitful murderers who worship a demon goddess and only come to the surface to slaughter indiscriminately, it’s actually pretty reasonable that people don’t accept you with open arms. More problematically, Salvatore still ignores the serious ramifications for the setting of his “people shouldn’t be judged on the basis of their race” theme. We see some exceptions to racial stereotypes like Drizzt and Fret, but we also see the standard Dungeons and Dragons attitude to the cannon-fodder races, like orcs and goblins, that exist solely as villains for adventurers to fight. The last thing people want in their tabletop gaming experience is moral ambiguity about whether it’s okay to have an awesome battle with monsters, so orcs, goblins, etc. are usually treated as invariably and inevitably evil to justify simulating the combat. But if it’s a major plot point for your story that drow aren’t necessarily evil, why should we assume that orcs are? “How can we know [if a race is evil]?” Drizzt pressed. “Just watch the children,” Montolio answered. He went on to explain the not so subtle differences between children of the goodly races and children of the evil races. Drizzt heard him, but distantly, needing no clarification. Always it seemed to come down to the children. […] And back in Menzoberranzan, what seemed like only a day ago and a thousand years ago at the same time, Drizzt’s father had expressed similar beliefs. “Are all drow children evil?” Zaknafein had wondered, and through all of his beleaguered life, Zaknafein had been haunted by the screams of dying children, drow nobles caught in the fire between warring families. So let’s get this straight: Montolio expounds some sort of weird racist justification about how it’s okay to kill orcs because their children are born evil. Drizzt hears this, thinks about the exact counterexample to Montolio’s viewpoint — because Drizzt’s own existence proves that not all children of evil races are evil — but never notices the opposition between these two concepts. It’s frustrating to watch characters miss the point so completely. Montolio feels like a much more sinister character to me now as an adult than he did when I was a teenager — the personification of the ugly questions about racism that the Drizzt books keep raising but then never addressing. The harshness of the world brings great remorse, but mercifully it is a passing lament and certainly not one to carry into battle. I cannot, therefore, look forward in despair, but rather with higher hopes for all in mind and with the determination that I might help to reach those heights. The hell? This is just… word salad. I get what he’s trying to say, but it’s phrased so awkwardly that it feels like it wasn’t written by a native English speaker. I wish he’d have people just express their emotions in a natural-feeling way instead of trying to make it sound so Masterpiece Theatre. The only character moment that worked well for me was Bruenor’s speech to Drizzt at the end, where he uses eating dog meat as an analogy (and unspoken apology) for how he realized that judging Drizzt by his race was wrong. Apart from making me genuinely laugh out loud, it actually worked for me on an emotional level because Bruenor is the only character here who won’t drop florid soliloquies at the drop of a hat. He’s terrible at expressing his emotions, so he does it through this rambling monologue that edges around the real subject. The end result is that it feels a lot more real and honest than the theatrical purple prose which everyone else spews to express their thoughts. There’s an awful lot of exposition of what happened in the previous two books. Some of it is worked naturally into the narrative, but other times it just feels like an out-of-place interruption. Having read three other trilogy endcap books recently, I’m starting to think that less is more when it comes to that sort of exposition. If your readers like your book, they’ll be intrigued by the backstory and go seek out the previous ones; if they don’t, they’re not going to care about your recap anyhow. There are a bunch of strange inconsistencies and little mistakes throughout the book. For instance, Drizzt’s drow boots are destroyed by sunlight at the very beginning of the novel, but then the rangers track him by his bootprints later. Apparently the spray from a mountain-fed waterfall makes you warmer in the winter, which is a neat trick. And gnolls are repeatedly referred to incorrectly as goblinoids, although that’s a fairly nerdy nitpick. It’s not a painful slog, but it’s still a mess. The pacing is very odd, the writing still isn’t great, and the characters and their motivations aren’t as well-handled as in the previous two books in this trilogy. Ultimately, it’s a much more forgettable book than the other two, which is a damn shame given the potential of the whole “Drizzt adapts to the surface world” concept. My breaking point came when we found out that Montolio has an “extensive” library in his fort. He’s a blind man living alone in the wilderness. So apparently he decided “Well, I’m going to go live as a hermit now. Guess I’d better haul a hundred pounds of books that neither I nor anyone else can read along to the place where I plan to die!” There’s just no way that can make sense from a story standpoint… but Salvatore needed some way to explain how Drizzt learned Common and surface-world customs, so he got a library regardless.